Each downloaded file include a Sample and the related Sound. Bug fix: disabled protection of the Factory Samples (of Firmware 2.5) that could not allow to install new samples. Enhanced audio output level (+ 100% peak level) for a stronger, cleaner and fatter sound. Synchronized LFO2, allowing to keep the same modulation phase on all notes. 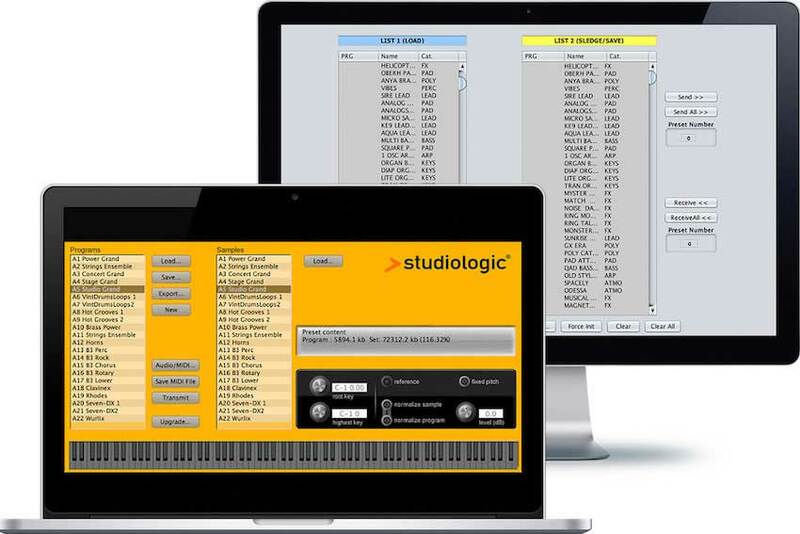 Sample Licence included (free of charge) that allows all previous Sledge to play samples, with no need of further updates or extra costs. Implementation of the MIDI standard message "All notes Off" (also known as "MIDI panic") in case of hanging notes after releasing all keys (also coming by MIDI IN) not correctly stopped by the related "note off". To activate the command, set MASTER VOLUME to zero (all the way to the left) and then rotate it again, to reach the desired value. Protection against rare random hanging notes (created by the Arpeggio function) that could occur when selecting many programs with Arpeggio in a very fast sequence. Protection against a very rare random INIT sound, recalled when rotating or selecting many Programs in sequence, under stressed conditions (full memory, many samples installed, complex programs). Fast and correct auto-setting of the Arpeggio TEMPO (as stored in the related Program) when recalling various Programs withe Arpeggio active, in a fast sequence. AUTO DUAL MODE: Sldge 2.0 can now play two sounds at the same time, in Split or Layes mode; the feature is controlled by a new page of the Global function and allows to simply keep one note (for Split) or more notes (for Layer) and then slect a new sound, that will be added to the previous sound; as any other sound, also Dual Sound combinations can be permanently stored in any of the 1.000 avaiable presets. GLOBAL PITCH & HOLD CONTROLS: a new Global page allow to enable the Pitch and the Hold separately for the Lower and Upper sounds in Dual Mode, allowing to use the Pitch bend on the Upper sound (i.e. for solo parts) and the Hold pedal to control only the Lower (to kepp playing a Drums groove or as a Damper for a Piano sound) and vice-versa, or to enable Pitch Bemd and Hold or both Upper and Lower sounds. REVERB + DELAY: a new function allows to mix both effects; the Reverb keeps the setting previously selected, while the real time controls (time and level) allows to set the parameters of Delay also when mixed to the reverb. SAMPLES: sound Samples can be trasmitted to Sledge and loaded in the internal 60 Mb of Flash memory, played by OSC 1 and modifiable by all parameters of the control panel, adding oscillators 2/3, setting filters, envelopes and effects. 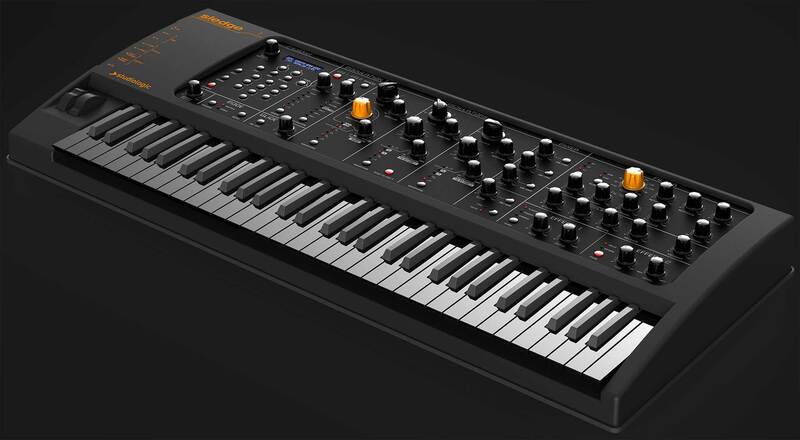 This feature can constantly expands the instrument's sounds and create a totally new combination of synthesis and sampling. ENHANCED POLYPHONY: the total maximun number or notes that can be playes at the same time have been expanded to 24, allowing to get a better real time control over the new sound pollibilities from synthesis and sampling together. When Sldge is connected with USB cable to a computer or MIDI Controller, with the control "All controls reset" the volume goes now to value 127 (instead of 0 or minimum, as in previous versions). Protection of the system when receiving data from MIDI IN during Power on; in previous version the instrument could ramdomly stop working correctly. Notes on the highest octabe could remain sustained when the instrument was transported to other tonality (different from 0=default). Arpeggiator speed adjustments and correct initial value. Improved stability on potentiometer's position and related value. Turn Sledge OFF/ON: the new Firmware version will be shown on the display. Includes all factory sounds of the Yellow Sledge and all exclusive sounds of the Black version for a total of 208 sounds. Load it and manage other sounds with Sound Mapper. 51 new sounds! Load it and manage other sounds with Sound Mapper. Load and manage your custom Samples with Spectre. Optimized conversion of short Loops in various format, with anti-click protection. ● Send or receive one, more or all sounds to/from Sledge via USB MIDI connection. Java 6 or higher, downloadable from www.java.com.